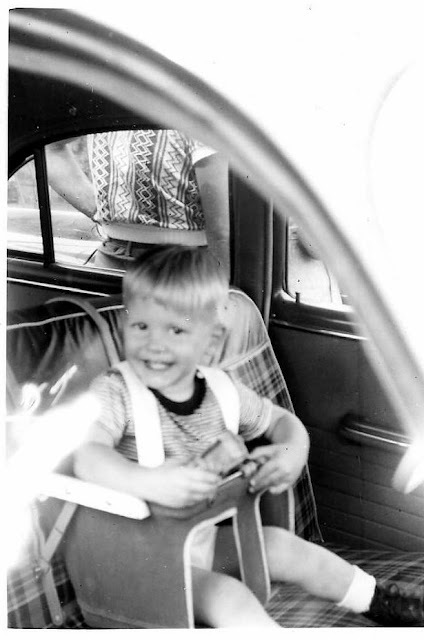 There I am in my carseat in 1951, 19 months old. The carseat I'm in just hooked over the top of the seat. It just rested on the seat at the bottom, because there were no seatbelts to attach it to. I'm facing forward, in the front seat, but then I didn't have to worry about being hit with an exploding airbag, either. I'm in the middle; the bench front seat sat 3 across, so I could provide maximum irritation to the driver. It's much different now, of course. Carseats are high tech. They obviously provide better protection. I might have been smiling and happy in that 1951 photo, but I'm sure not putting my grandchildren in something like this. My own kids (in the 1980s) had as good a carseats as we could find at the time. But there were advances in technology to come. With technology comes complications -- my daughter nagged me into going to the police station to have my installation of a carseat verified for correctness before she would let her son ride in it [it was]. I have occasionally not allowed proper spacing between the rear facing carseat and the front seat, in part because the carseat is very large and my wife or I will move the passenger seat back for comfort. You have to wonder if we've reached the point of diminishing returns on carseat safety -- much as, for example, we did with front airbags. Are advances in carseat technology still significant increases in child safety? I wonder.